Well, it's three months (one day to four months) behind the actual schedule (it was scheduled to be released last June), but it is finally released (after i pushed the developer a little bit ). Without further ADO, here's CD Forum Linux 8.10 "Love" Edition. It's a LiveCD (Slackware based) which contains offline version of Indonesian Linux Forum. It's part of ID-Slackware community effort to help people who doesn't have bandwidth luxuries and dedicated Internet access to access the Forum all the time. We tried our best to reduce the ISO file size at an acceptable level for a complete Linux distribution without sacrificing the users conformance. The first edition was released at December 2007 and it was scheduled to be released in six month cycle, but we're a little bit late on this release. Sorry for that. One of the biggest effort was to minimize the ISO size (see the changelog below for HUGE Reduction on ISO size) and also upgrading the phpBB engine into phpBB 3.x. This release is called "Love" edition. We hope you would love GNU/Linux and also Open Source project/communities as well as we love them. Data statistics: 89.042 posting, 14.113 topics, and 10.661 members. Posting amount has increased 25%, and members has increased 30% from 7.12 edition. We currently don't have too much artwork, but we provide the secondary wallpaper (1024x768 - 1280x800), just in case you don't like the blue color (1024x768 | 1280 x 800). The second one is green. If that doesn't suit you as well, you can change the color, as we provide the source in SVG also. Currently, there is only one developer, I Made Sathyabudi Adnyana from Baliwae. Anybody interested in developing this project, please contact me or Budi. We need support for mirroring the ISO in order to reduce server's load. Any help is appreciated. Please contact Budi if you want to host a mirror for this project and helping us to distribute the ISO. We hope you enjoy using this product as well as we who maintain it. The third (hopefully the last) Release Candidate before the final OpenOffice.org 3.0 comes up has been released today and it will be followed by the final version if nothing major showed up. I think the schedule has moved a bit, but perhaps only for a few days up to one week. Let's hope it will be a great release for OOo community as well as Open Source project. Full release note can be read here. At that time, the biggest server known was DalNet, but nowadays, people often choose Freenode because many open source project uses that server instead of the DalNet. I usually go to ##slackware because i'm a Slackware users. I believe many Linux users have their own channel at Freenode too. For some times, people who used Atheros chipset for their WLAN devices are confused since it's not integrated in the Linux kernel (yet). They have to use MadWifi drivers who used proprietary HAL to make the devices works on Linux. The pain will be gone in the future. Few months ago, they (Atheros) had released the ath9k driver for 802.11n ASICs on Linux. It will be part of Linux kernel (hopefully 2.6.27 which will be released in short time) as people have responded and they are pleased to see this driver gets merged in. Few days ago, they have made another movement by releasing their HAL (hardware abstraction layer) used for their 802.11a/b/g devices under the ISC. This will make the maintenance of the driver gets better in the future and hopefully, better support of all Atheros chipsets under Linux. Read the announcements on LKML. I have just finished watching EPL match between Manchester United and Bolton live from Justin's Streaming Site. Today's broadcast was very bad (broadcasted from Setanta Networks). They have lots of buffering and even worse, not broadcasting. It's very different with the broadcast i saw two weeks ago. At that time, i really had a clear broadcast. Too bad they don't have an option to turn off or hide the chat room. It's so inconvenience to see people taking using bad words (well, it's a free service after all). Well, the good news is that MU won 2-0 and it's a good start for them who struggled at the beginning of this season due to many injured players. VI Web Access: VI Web Access enables you to perform host and virtual machine configuration on VMware Server 2.0. This intuitive web-based interface provides a simple and flexible tool for virtual machine management. VMware Remote Console: VMware Remote Console enables you to interact with the guest operating system on the host or a remote system. After you install it as a Web browser add-on, it can run independently from VI Web Access. VMware Remote Console also allows you to connect and disconnect client CD/DVD and floppy devices. USB 2.0 Device Support: VMware Server now supports faster data transfer with USB devices plugged into the host system. If the guest operating system has appropriate USB 2.0 device drivers, you can use peripherals that require high-speed performance, such as speakers, webcams, next-generation printers and scanners, and fast storage devices. Increased RAM support: The maximum amount of memory that can be allocated per virtual machine has been raised from 3.6GB to 8GB. The amount of memory used by all virtual machines combined is limited only by the amount of the host computer's RAM. Improved 64-bit guest support: 64-bit guest operating systems that run on Intel EM64T VT-capable or AMD64 revision D or later processors are fully supported. Native 64-bit host support on Linux: VMware Server now runs natively on 64-bit Linux host operating systems. Quiesced backups of virtual machines: On Windows hosts, you can enable the VMware VSS Writer, which uses snapshots to maintain the data integrity of applications running inside the virtual machine when you take backups. VMCI Sockets interface: This feature provides a sockets interface for the Virtual Machine Communication Interface, which provides a faster means of communication among applications running on the host and in virtual machines. For more information, see the VMCI Sockets Programming Guide. Hot add and remove for SCSI hard disks: You can now add and remove SCSI virtual hard disks while the virtual machine is running in hardware version 7 virtual machines. Finally, the final version of Yahoo Messenger 9 is out. There hasn't been too much publication in the last three months and suddenly, it just came out like that. What's nice in this major version is that it supports for Indonesian language as well (i am not sure whether YM 8.x has it or not). By the way, YM 9 may bring bad news for Vista users, since some features are not available on Vista (and MAC users). Check the feature list for more detailed information. It's just a matter of time before those features are adopted in Vista and Mac, but for now, XP users will be pleased to see that they could get the best of YM 9. Today is my last day teaching before there will be one week off and then one more week of teaching (in the beginning of October) and then two weeks of mid test. Since most of my students have to give their mid presentation in the next two weeks, i could take some little break this week, since i'm overload already. Lots of new tasks were coming unexpectedly and sometimes, it messed up my schedule. Well, i'm too tired now . Let's continue tomorrow, shall we? I don't know whether it's just my opinion or you think so too that most children nowadays have lower reading habits than children in the past. I have asked this to my several students and on average they gave the same answers. Just small comparison. During my study, i usually rushed to the library as soon as the lecturer gave the reference books because i wanted to have the book ASAP and read it so that i'm prepared for next class because i have read it first. This condition is very rare nowadays. They just wait for their lecturers to gave them materials and that's it. No motivation to search in other references (paper, journals, articles in Internet, etc). In simple words, they became more passive. One of the reason is probably to entertainment world which has become so dominant nowadays. Name it video games, online games, pub, etc. Even in small city like Jogja this kind of "distraction" has become more and more aggressive. Students are not strong enough to fight this new "world". They are pulled in this new world and forget something they should do, study. With only a week to release the final version of OOo 3.0 (if not delayed), OOo team has released second Release Candidate this morning for testers and people who can't wait to see what's inside OOo 3.0. Please note that this version is NOT YET considered stable (even though it won't harm your system if you used it). Do not use this version on production activities yet. Just wait for the final version which should come out in the next one or two weeks. The Release Notes will tell you almost all of the detailed changes. When i attend the pre-graduation night just know, i saw most people wear Batik, including me. Friday is a special day in Jogja, because the governor has suggested that people should wear Batik on Friday when they go to work. Why? Because it's one of the historical culture of Indonesian and not many people realizes that Batik is very nice. Two months ago, i wrote about several Scientific Calculator and it received several good responses from people around the world. One of them posted as comments and the others sent a direct email to me. Thanks for that. 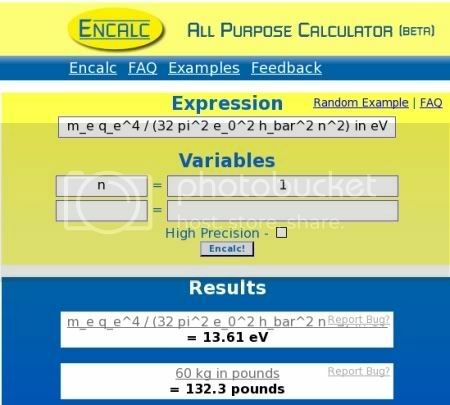 This morning, i got an email from one of Stanford's students that are working on all purpose calculator called Encalc Online Scientific Calcultor. Why should i bother posting another calculator? Because this one is more like Google. They can parse your input and you can define variables in it and it will try to guess and calculate it for you. They also support physical constants, used in many calculations, such as speed of light or Pi. In short, they are more flexible. You can make your own equation and asked this application to calculate it for you. Here's an example taken from the author's email sent to me. you to send calculations in an email. Encalc will automatically update the url after each calculation, making it easy to copy and paste a calculation into an email that you send to a friend. When you are done calculating something, right click on the results and you will get the URL of the calculation you are working for. This morning, i read an article about EasyStroke, gesture-recognition application for X11 (Linux platform). This application can be used to create your own gestures, like what Mac user had on their Macintosh platform. Some application already has mouse gestures, for example Opera and Firefox (implemented in Extensions). This application can be compiled from source or if you are using Ubuntu, you can just use apt-get to get this package (lucky you). I wasn't able to compile it from source since it resulted in errors. Perhaps i need to update several libraries on my computer before i can start compiling this package. Remember that those new thing were done on their 20% time during working at Google. Nice job and we are waiting for more addon in the future. In the past, MegaUpload, one of the biggest web hoster besides Rapidshare blocked Indonesian IP address by saying that all slots for Indonesian users were used and we were forced to buy MU account or install their toolbar which works in IE and Firefox. Nowadays, they let Indonesian IP to download from their servers without using any toolbar or using premium account. Even though free users are limited, IMHO it's more loose than RS free user privileges. For example, in RS you will have to wait for few minutes (and even hours) after you have download one big file. This limitation is not listed in MU. The only same limitation are that we can only download one file at a time and no download manager support for free users. Nevertheless, i still prefer RS for now. Perhaps i will add MU account in the future, but not now. I still see lots of sites prefer to use RS rather than MU. Thanks to Alois W. who posted that URL on his facebook account status. We now have more options than before. After Sourceforge, Google Code, Microsoft CodePlex, here somes another one from another big company: Sun Microsystem. They have launched Project Kenai that acts like the rest of the project above: provide free hosting for open source projects. This project was started at June and they already got 19 projects so far. Anybody wants to join this? Well, the seminar was quite success, with over 300 participants attended this event this morning. Many students were eager to hear the topic about license and most of them asked during the QA session, because sometimes it's truly confusing. Well, i used Linux most of the time, so i don't get confused with Microsoft's license scheme for now. I deleted some contacts and now i'm able to re-add those who hasn't been added before. Any similar experience like this? Or is it just Pidgin's problem? IMHO it's Yahoo's limitation. In the past, Priyadi already post about this, but then the limit was raised. If i'm not mistaken, it was 600 contacts at that time, and now i have reached 1000. Perhaps i do have to delete some of the contacts. Today, my colleague asked me to be the moderator for tomorrow's seminar at my campus. The topic is about license. Actually, i registered as a participant, but somehow, i will become the moderator . Becoming tomorrow's moderator will be my first experience as i never do this before (well, i'm used to teach in front of the class, but not as a moderator). Let's hope tomorrow will be just fine. I should sleep earlier today as i have to pick up the speaker early in the morning tomorrow. Finally my Internet connection is back today. The technician came back and bring me a new modem, since my old modem was the root of the problem. My old modem was Shiro and the new one is JKNetworks. The technician told me that Shiro is a bad product, but IMHO, it's more configurable than JK. You can have more feature in it, rather than the simple version found on JKNetworks. I have no experience with JKNetworks, so any Speedy users with JKNetworks are willing to share their experiences with it? Oh yeah, i have to pay 220000 IDR for that modem, since the warranty for Shiro was only three months and i have been using Speedy since January. For those who wanted to use Google Chrome on Linux platform, you will be pleased to hear that the latest Wine build (1.1.4) has better support for Google Chrome. I haven't tested this yet, as the Slackware version hasn't come out yet at the time i write this post, but when it's out, i will try it out. Let's hope it works like charm, while waiting for Google to publish the Linux edition (which i think will use Wine like their Picasa product as well). Have you ever feel one day without Internet? What is it like? Well, i had it today, as my Speedy connection is still unavailable. The technician which should have come this morning couldn't come and they didn't even tell me that they weren't coming. I have waited four hours and it wasted my time. I called Speedy Care and no one answered the phone. I finally got to the operators at 1 PM, and they told me that my ticket was gone, so they couldn't contact me (my problem wasn't solved yet, and they have deleted the tickets, OMG!!!). This is the second time they couldn't fulfill their promises. First one occurred in Friday, where they should have come at 2 PM, but until 5 PM, they didn't showed up. I asked time to reschedule the maintenance problem on Sunday, as i had to go on Saturday and they agreed. I asked them to get as fast as possible and they said that they usually start dispatching technicians at 9 or 10 AM. I'm OK with that, but four hours of waiting is something unusual. Good news for people who are eager to see OpenOffice.org 3.0 which is scheduled to be released this month. An RC 1 release is now available through OpenOffice.org Developer Snapshot Builds. You can help the project by testing this RC release and report any bug you encountered to be fixed in the next release and before the final version comes up late this month. You can see the latest changes here. Please note that this version is NOT intended to be used on production machine (yet). It's more intended for developers, testers, and users trying to make OpenOffice.org better by giving it a try and report any bugs found. It seems that my Internet problem is not on the mass disruption only, since today i couldn't connect whole day, leaving me with a dial up connection (lucky me i didn't throw away my old modem, which i could use to check my emails). I have asked the technicians about the problem and they told me to try put the line directly to the provider's line, bypassing the splitter which splits the data and sound in the telephone cables, but it didn't work out, so meaning that the problem lies on the network. After having mass disruption for a few days, my connection is now back to stable again. I can get 70-80 KB/s when downloading from foreign site and sometimes i can even get 106 KB/s (the site i know are Microsoft and Symantec). For local site which are connected to IIX or OpenIXP, i can get around 100 KB/s. Actually, until this morning, my connection was still in bad condition. I called Speedy Care, not 147 (this is Customer Service). I asked them whether the mass disruption has been fixed or not. They said that they have fixed it and there were no complaints anymore about this. Well, mine is still having problem . I asked them whether i have to restart my modem and they said it isn't necessary because the routing will be redirected automatically. Let's hope there won't be any problem again in the future. This week we have completed the infrastructure upgrade with the result, that premium users can now enjoy full speed again. Also, we are able to allocate bandwith to free users dynamically: Depending on the overall traffic you can up- and download with up to 2,0 megabit per second. If it is crowded though, you might experience only 0,2 megabit per second, since we always put our premium users first. Thus, we have raised the daily premium download traffic from 5 gigabyte to 10 gigabyte. Please keep in mind that it is still necessary to limit the maximum download speed for free users to protect RapidShare from congestion caused by automated downloading. To compensate for that, we already eliminated the waiting period before starting a succeeding download. We wish you a pleasant time using rapidshare.com and apologize for any inconvenience you might have experienced during the transition period. It's like that there's nothing on this world that can't be made in Google. They have conquered the search engine market, and then they travel throughout other market as well, such as Social network, Image management tools, Local search engine, Earth project, Map project, and many other things on their labs waiting to be published. Today, they announced another product, which called Google Chrome. It's a web browser (YES, it's yet another WEB BROWSER). Like all Google's product, they tried to make their product as simple as possible, with clean interface. But that's only in the front end. Deep inside the code, they have put Java Script engine called V8 which should give better performance compared to other products available. They are focusing on the JS engine since probably most of their products uses JS. They combined WebKit and Mozilla's Firefox to produce a better product and even better, they make the source code available to public. This morning, my speedy connection was down and the DSL light was off and it won't turned on again, even after i restarted the modem several time. I asked 147 and they asked me to look on the DSL splitter. Since i have three classes today, i don't have time to look on it in the morning. When i was on my way back home, i bought the splitter and i changed the one in my house. No luck. My phone was dead as well, so i finally decided to leave it just for now. What do you know? When i tried to trick the modem so i could get some IP from the modem, the DSL works and now i'm back online again. I don't know what's the problem, but the good thing is that now i can go online again.